The Philadelphia Business Journal has exciting news to share – Peirce College will soon offer master’s degrees! Many of our undergraduate students and alumni have told us about the success they've achieved by pursuing higher education at Peirce. We've featured a few of their stories on the blog before. Many of them have also told us how important lifelong learning and career advancement is to them. Many students have also asked us what other options are available to help further their education and career. We recognized an ideal way to meet this need and are now proud to announce the launch of graduate level education at Peirce College! The new master's degree program focuses on helping students sharpen their leadership abilities, while providing a means for lifelong learning. We provided the details of our jump into graduate education to Philadelphia Business Journal reporter Peter Key, who reported on our new program today. Check out the story for more details about the program, including how it can help your career and how you can get involved. Simply click on the link, then scroll over to page 4 for the full article. We'll be posting more details about the program on the blog on Monday and in the coming weeks and months, so keep an eye out here for all the latest news. CDS hosted the annual "Dress for Success" workshop last week and for those of you who couldn't make it, we wanted to recap the topics so everyone can benefit from the great information that was shared. The most important point we focused on throughout the evening was how your appearance influences the way others perceive you, including your level of professionalism, your attitude, and your desire and interest to be a member of that organization. The first part of the session covered what to wear to an interview, a topic we've discussed on our blog before. For a refresher, be sure to click over to read that post. Remember: You want to be remembered for what you bring to the table during an interview, not what you're wearing. When looking for information to choose a degree program, adult learners can find myriad tips on considering passion, interest, and aptitude. But few recommendations focus on the other, equally important, side of the equation: what not to consider when choosing a degree program. There are some common pitfalls we often see adult learners make when making this decision. We wanted to highlight them here to help you avoid making these mistakes and picking a degree program that might not completely meet your wants and needs. Here are the four-biggest don'ts to selecting your college degree program. 1. Don't pursue a degree program for which you have no passion or interest. Be frank about your skills and interests, and find a field that feeds your purpose and drive. For instance, if you are motivated by helping others, consider a career in the healthcare field. Or if you have a goal to work for yourself, a business administration degree program could be appropriate for you. 2. Don't base your degree decisions on what others have done. Your skills, goals, and circumstances vary from friends and family. Learn from others but remember to make decisions based on your wants and needs. What worked for them might not work for you, and vice versa. It's OK to carve out your own path, and try something new and different. 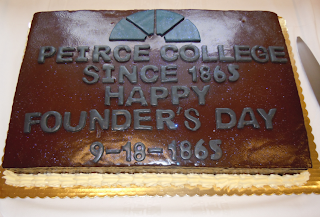 Happy 147th Birthday to Peirce College! Yesterday, Peirce College celebrated its 147th Founder's Day, commemorating the date in 1865 when Thomas May Peirce founded the College. The College opened its doors to provide practical, business education in the post-Civil War years. The inaugural class was made up of nine men, all veterans of the Union Army, who returned to Philadelphia after the war. Thomas May Peirce wanted to afford his students a successful transition from army to business by giving them a solid education they could apply in the changing workforce. our birthday cake with three Peirce work-study students. By the end of the College's first year, enrollment for classes had increased to 569 students. Of these, 68 were women, making Peirce the second college in Pennsylvania to accept female students. Thomas May Peirce felt strongly about providing women the opportunity to earn an education and said that at his school, "no door will ever be closed to women." 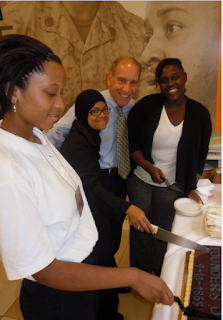 In recognition of 147 years of career- and business-driven education, the Peirce community got together to celebrate with cake and coffee, raising our cups to the vision of Thomas May Peirce and the future of Peirce College. Happy 147th Birthday, Peirce College! at our "Dress for Success" event! You've studied hard, earned your degree, applied for your dream job, and secured the interview. Now it's time to decide what to wear. Well, you've come to the right place, because we can help with that! Each year our Career Development Services (CDS) team holds a "Dress for Success" event to help adult learners wear the appropriate attire to job interviews and in the workplace. Each career and position is different, and our team can help you select the business wear that fits your specific needs and helps you make the best impression on your interviewers and colleagues. 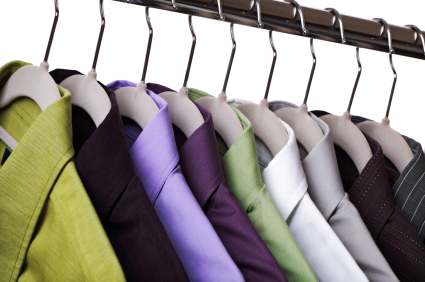 We'll also guide you through creating an overall professional image, above and beyond wardrobe choices. And attendees will learn about available partnerships to provide you with free career advice and a starter wardrobe. One of those partnerships is Career Wardrobe, an organization dedicated to helping women in Philadelphia with the clothing, career skills, and confidence necessary to transition to work. This year's event will be held on Tuesday, Sept. 18, from 5:30 p.m. - 7:30 p.m. in room 69 of our main building at 1420 Pine Street, Philadelphia. It's open to all students and alumni of the College, and will be facilitated by me and other members of the CDS team. Please RSVP to CDS@peirce.edu or 215.670.9202 by Sept. 17 to claim your spot. If you can't make it to the event this year but still want to dress to impress on the job, check out our tips for what you should and shouldn't wear to an interview. And don't forget last year's spring fashion show, where Peirce students and staff strutted down the runway to model the best and worst ways to present yourself in a professional setting. We're really looking forward to sharing our advice and knowledge on proper workplace attire with our attendees. Hope to see you there! Classes are underway and hopefully you've read our blog post on how to get focused on your studies this school year. To add to that advice, we're offering lots of student support services this fall to help you make the most of your academic experience and career development. Our Career Development Services (CDS), Walker Center for Academic Excellence, and First Year Initiative (FYI) programs each have a full schedule of student resources available this fall. Designed to help you get to know your support team, excel in your classes, and succeed as an adult learner, these programs offer a little something for everyone. Virtual workshops and resources are also available. Check out the posters below for detailed information on events, dates, and times. 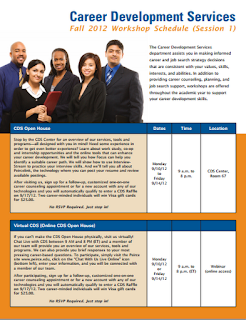 If you'd like to attend a CDS event, please RSVP to CDS@peirce.edu or 215.670.9202 by the dates listed on the flyer. If you can't attend one of the scheduled workshops, you can contact the CDS team to make an appointment for a personalized session. Is a traditional or functional resume better for adult learners? If you're sitting down to craft or revise your resume, you're probably following the traditional resume format. This format consists of listing your work experience chronologically, starting with your most recent position, and defining your duties, skills, and accomplishments in each role. But many adult learners don't realize there's another accepted and effective way to structure their resume. It's called the functional resume format, and it's broken down by skill set rather than work history. 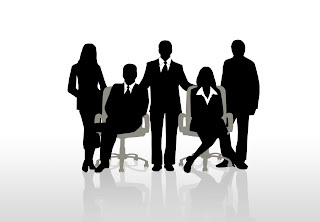 For example, a major subhead could be "Team Leader," under which you list your experience at various organizations. Another could be "Project Manager," where you list your accomplishments throughout your career in this role. A functional resume can be better for adult learners who are transitioning into a new career field or jumping into the workforce after an absence because it highlights how your skills can be applied across sectors, rather than limiting your skill set to one industry or position. 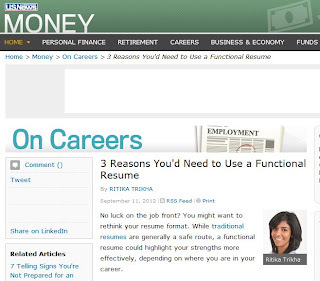 I spoke about functional and traditional resumes on the blog before, and when Ritika Trikha of U.S. News & World Report approached me to expand on the pros of a functional resume, I was happy to oblige. She shared three reasons why you might want to use a functional resume format as opposed to a traditional one, and I gave my advice throughout. Hop over to read the article in full. Thanks for sharing my advice, Ritika! If you're a regular blog reader, you've probably seen us highlight Kappa Nu, Peirce's chapter of Delta Mu Delta, before. Delta Mu Delta, the International Honor Society in Business Administration, is nationally recognized for identifying academic excellence across the country, so we were thrilled to hear that a Peirce student recently won a Delta Mu Delta 2012 scholarship! Desiree Lynn Mitchem, who's earning her bachelor's degree in Accounting, is the first Peirce student to win this $500 award. She currently lives in Gettysburg, Penn., where she works full-time as an Accounting Support Specialist at BAE Systems and attends Peirce online. 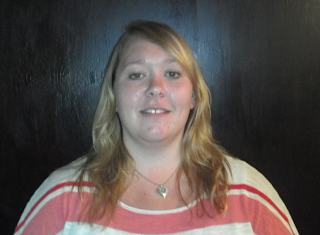 She started at Peirce in January 2011 and was invited to join Delta Mu Delta in December of that same year.